I say 'our' because this year, I've been involved in CirculArt trail in 2 different projects. Firstly the Move on Up 'Art in Community' class that I teach in Cambridge have taken part and their wonderful work can be seen at the Children's Society Shop in Mill Rd. All fabrics used were donated to the shop. 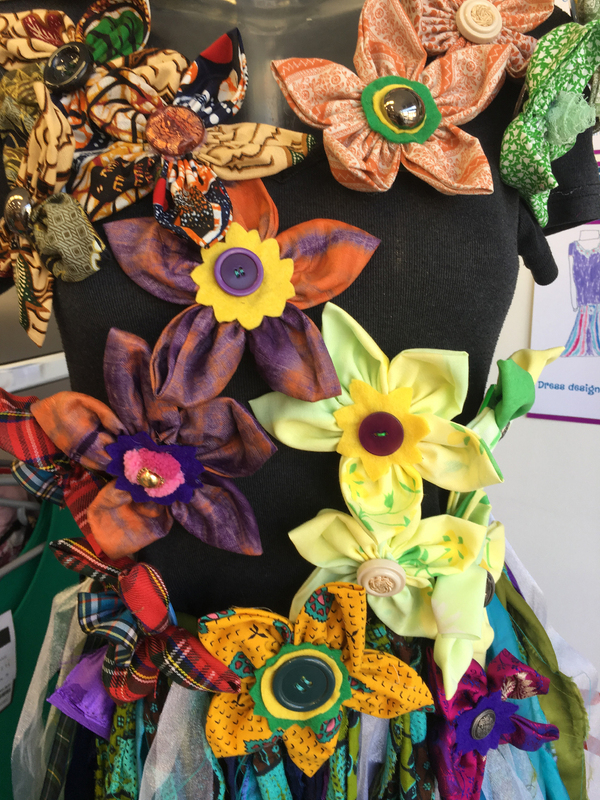 If you'd like to own a piece of this, all the flowers are attached to pins and will be on sale after the exhibition with proceeds going to the Children’s Society. And secondly, I have participated in this project myself - and mine is in the Romsey Mill shop just down the road. My own work is a dress that I made from old sheets that I dyed and printed (of course). 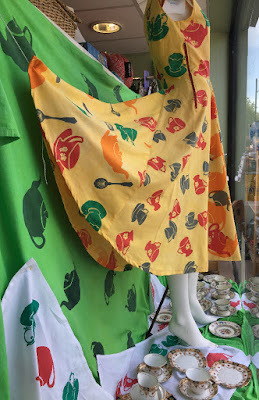 I was inspired by the sheer amount of bric an brac in the shop -especially tea sets and I wanted make something very bright and quite simple so it would stand out against the very busy Mill Rd. 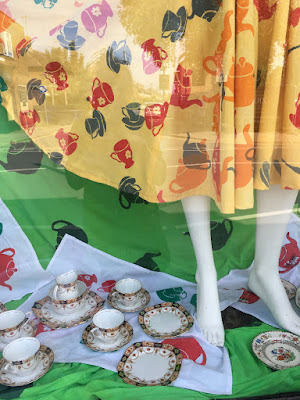 And as you can see, the shop has saved some very secial tea sets to display with the dress. So they will be on sale at the end of the exhibition. There's lots of other wonderful artists particpating in this event which is organised by Cambridge Carbon Footprint, a charity who’s aim is to promote sustainability in Cambridge. And this year, all the charity shops (except one) in Cambridge are taking part. The trail is live from 7th June until 28th June 2018, you can pick up a CirculART Trail map from participating shops and other select locations around Cambridge. 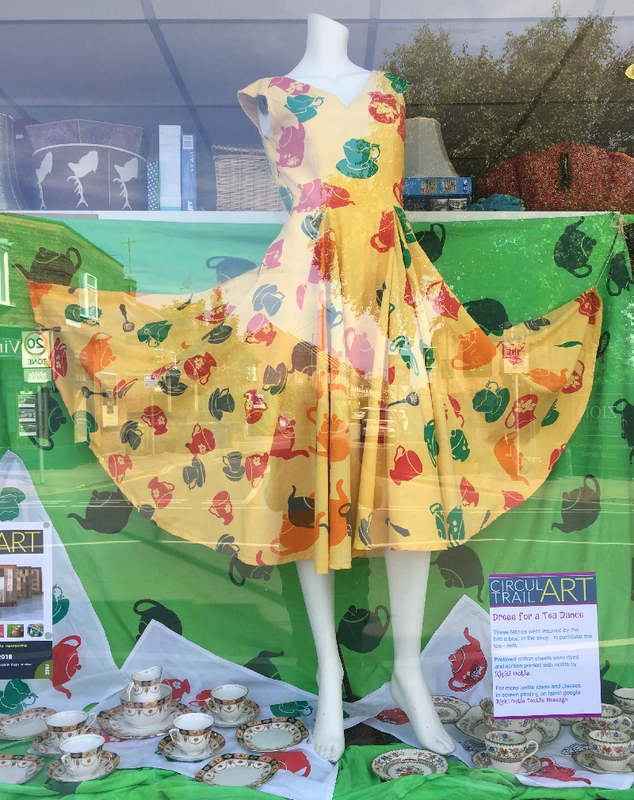 The CirculART Trail is a celebration of art and creativity, repurposing and recycling, and highlights the significant role that our charity shops play in reducing waste. All artists who participate artists use repurposed materials in their art and display their work in the windows of Cambridge’s charity shops.